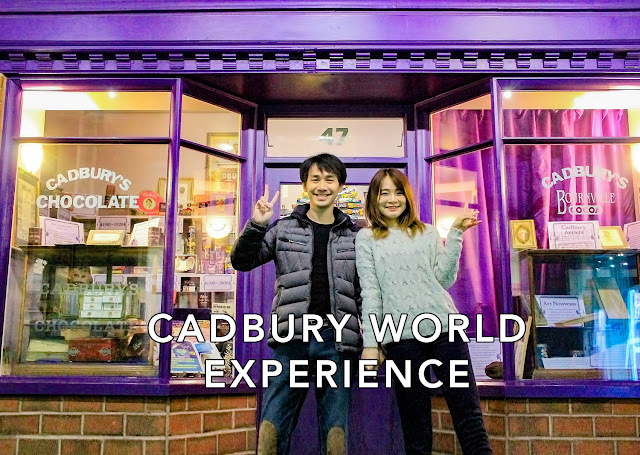 Last Thursday, I went to Cadbury World with Mat. The area is near to our house, so we decided to give it a go. Luckily, it was sunny that day, so we managed to keep our plan to walk there successfully. I love chocolates, Mat knows that clearly that once I start on a bar, I can’t stop munching until it’s all gone. It is never enough, especially Dark Chocolate. Yes, I LOVE Dark chocolate a lot! We heard from our friends; Erni and Clara, where there is a buy-1-get-1 free package at Cadbury World every Thursday. One day, I unintentionally checked Cadbury World’s Instagram because Mat was checking their website and I found out that the deal was on sale this month! Wow, what a coincidence! On the next day, Mat booked and paid our ticket by phone for the ‘Purple Thursday’, the code that we need to quote for getting the deal. I was fascinated by Mat’s direct action to bring me there! I wanted to go to Cadbury World since the first day I've arrived in Birmingham because I love chocolate. Hmm, who doesn’t love Chocolates?! We arrived 30 minutes earlier before our tour, so we went to the 4D Chocolate Adventure first. The ride was fun for us, I know, we were just like little kids having fun together and loving every single thing there. We still got 15 minutes before our turn to enter the main attraction, so we had a quick lunch at the playing area. At first, I was afraid that it'd be a child-focused attraction. However, we had a fabulous time! We've spent 2 hours in total and received free chocolate bars as well. We enjoyed our time so much there! For the main attraction, it's a self-guided tour so we could walk with our speed. I prefer it that way so I can spend my time looking at everything in detail without feeling rushed. It was entertaining to learn the life of its owner and the community. You can watch my video on youtube (below) so you can follow my experience at Cadbury World. The only downsides were some parts could be better and more appealing. I wish I could see their factory like when I was in Tokyo with Pocky. I think once you have visited it, you probably won't go back again. However, if you haven’t been there before, then it’s definitely worth the trip!